Following on from string quartets no. 1 and no. 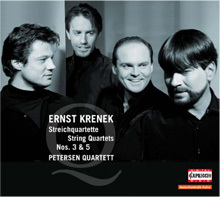 7 (CD 67 015), the Petersen Quartett now presents Ernst Krenek’s quartets no. 3 and no. 5, both written by the young composer during the period preceding World War II. While Krenek dedicated his third string quartet to composer colleague Paul Hindemith, his fifth quartet attempted to grapple with the heritage of Austrian music in general and Franz Schubert in particular.